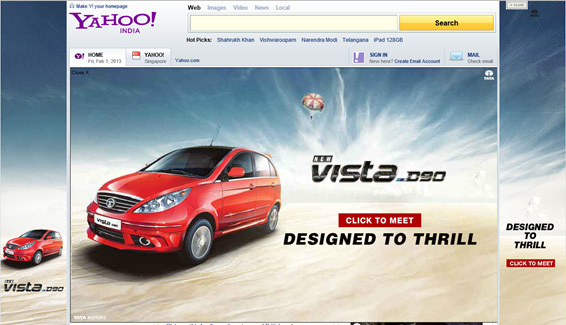 TATA Motors not only executed a brilliant takeover on MSN India, they took over nearly all high impact branding units across key publishers last week for the new Vista D90 launch. The campaign communication is ‘Designed to Thrill’ which highlights the technology innovations and a powerful new diesel motor that the new car comes equipped with. 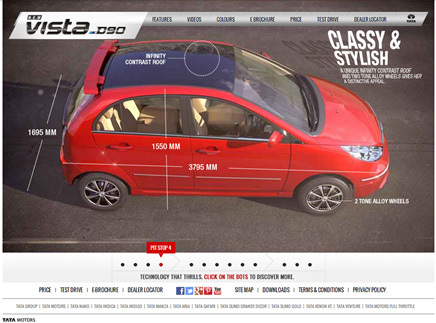 The Vista D90 website layout is simple and effective. I especially loved the slick transitions on the features page, which lets you explore the car interiors and exterior in detail. 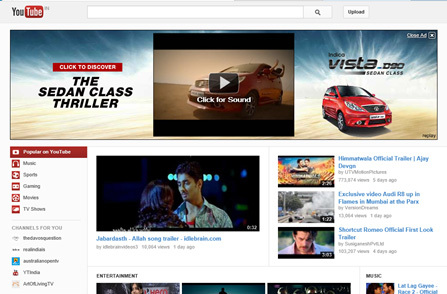 I am not sure why a Youtube video embed wasn’t used on the Videos page considering they do have a Youtube Channel. The rest of the site has the usual utilitarian links to the e-Brochure, Price, Dealer Locator and Test Drive form. In keeping with the high-powered theme, the D90 was launched at the Buddh International Circuit for Dealers and Bloggers. The launch was also covered via a webcast on the site, a recorded video is now available to view here. TATA Motors has done a great job with consolidating all its group sites with cross linkages which aids discover-ability, SEO and is generally a better practice that creating standalone microsites for every new launch. There are some issues with multi-browser compatibility, which should be looked into. Facebook had to be an important element for the campaign and The Vista Surprise brand page prolifically covers feature centric posts.